We Guzzi riders span all walks of life. From a piano tuner in Kansas, real estate agent in Illinois, Aerospace engineer in California, to the American country boy who carried lumber for his carpenter father and the young seamstress in England, we come together. We settle down on a common ground - the common ground of the MGNOC. We bring the best we have within us and offer it to our fellow motorcyclists. We may ride three thousand miles, we may host a rally, or attend a local meeting; it doesn't really matter. We want to be together. Lifetime MGNOC members Wes and Pat Stevens have ridden all over this country to experience the common ground, bringing their Guzzi passion to share with us. During the depression Titus and Ina Rose Stevens had to go where they could to earn a buck. Titus became a jack-of-all-trades, working the railroad, raising cattle, and doing carpentry. Eventually, the couple settled near Washburn, Missouri, at the Stevens' homestead of Titus's parents where they would raise a family. Daughter Henrietta was the first child to come along (she goes by the name of Hank). Santa Claus came late, a day after Christmas, for Titus and Ina Rose delivering baby Wesley in the year of 1942. After Wesley, the birth of baby Kathy would round out the family. For thirty years the Stevens' owned and operated a country store and Sinclair gas station six miles outside of Washburn, population of two hundred and fifty. Titus was a skilled carpenter and took pride in his finish work. He was pretty handy at most things he tackled and passed on his skills to Wes. When Wes was sixteen years old his father built a half dozen homes for resale and put him to work carrying lumber and driving nails. Wes learned how to build things. Through his mother he learned how to be thrifty, manage his finances, and live within a budget. Titus passed away four years ago. Ina Rose continues to live on the old homestead. In 1960 Wes graduated from high school among a class of only twenty-two students. He left home to find his niche. He ended up in Kansas City working in an envelope factory as a mechanic. He soon became restless and went back home. Wes wanted to travel; he wanted to see the world but didn't have any money. The military seemed to be the ticket. Two years later he enlisted into the Air Force. He did basic training at the Lackland Air Force Base in Texas. For his technical training he was sent to Keesler Air Force Base in Mississippi. He would spend twenty years in the service. He specialized in electronics and ground communications. While stationed in England he was destined to meet his future wife, Pat. Pat was born to James and Ivy Lemon in Brumbury, England. Her siblings are younger brother Phillip and sister Beryel. Ivy did domestic work. James used to care and train horses and hounds for the gentry's sport of fox hunting - until he was involved in a terrible motorcycle accident. Pat tells the story, "My dad rode motorbikes years before I was born. I didn't grow up around bikes because he had already lost his legs by the time he married my mother. I don't know a lot about it, but I do know that he was a passenger when he had the accident. It was during a power blackout that a drunken truck driver struck him. He lost his legs and was in a coma for six months. Nothing was ever done about it." After James married Ivy they made a living doing factory work. Pat was very close to her father and says of him, "My dad was very generous. He would give you the food off his plate. He was a giver." At fifteen years old, Pat graduated high school in Brumbury and went to work as a seamstress at a sewing factory making surgical undergarments. She worked there for three and a half years until the time she met Wes. Pat said, "My supervisor at the sewing factory was an English girl who was married to an American serviceman. She invited me to go to the Air Force base for a NCO (non-commissioned officer) Halloween dance, so I went with her. Her husband was a friend and co-worker of Wes. The party was at the communications site at the RAF Croughton base. I had never been out with an American. My folks kind of wondered about them yanks since they had a bad reputation in the pubs. I was warned to stay away from those yanks." It was before the era of satellites, and radio communication and it was extremely important for information and Wes was doing maintenance to keep their radios working. The Halloween party sounded fun. He remembers, "It was a rather a small club and I wasn't a commissioned officer yet, still an E4. I had dated some Spanish girls during a tour of Spain and the customs were a lot different there. When you dated a Spanish girl you had a chaperone, her older sister or aunt. If they really trusted you, maybe her little brother would accompany you. In England I had this Yank reputation to live down. At the party when I met Pat, I saw a good-looking girl I wanted to date." Upon meeting Wes, Pat thought, "He was a real gentleman and he wasn't what I thought Americans were like. I really liked him, but I was kind of scared to take him home to meet my parents." Wes had a few suits made for him while in Spain and had saved a little money. He made a good impression on Pat's parents. Her parents, especially her dad, made him feel very welcome. James and Ivy cared for Wes very much after they got to know him, treating him like royalty. Wes and Pat begin dating, driving through the countryside, visiting pubs and going to movies. They gradually fell in love. 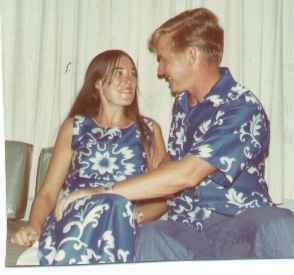 Several months later, in 1965, Wes proposed to Pat. They had a small humble wedding, nothing fancy; a justice of the peace married them. The newly weds rented a duplex in Brumbury, bought a brand new powder blue, white top convertible Triumph sports car and traveled in style. Soon, daughter Joanne was born. Relocating because Wes was transferred to Ogden Air Force Base in Utah during the summer of 1967 from England was, of course, a monumental life change for the Stevens. Wearing a matching dress and jacket outfit, Pat was not used to the heat that greeted them as she stepped off the plane in New York. After a helicopter ride to Manhattan and an over night stay, they picked up a car and drove out to the Stevens' homestead in Missouri. The family reunion was short but sweet as Wes, Pat and two year old Joanne left for the cross-country drive to Ogden. 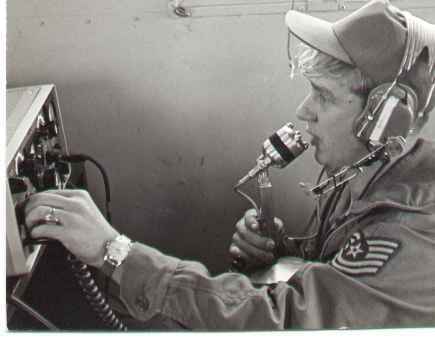 Before they had left England, Wes was promoted a step in rank to an E5 and in Utah he would be doing radio maintenance in the aircraft control tower. The family lived in on-base housing for the next three years and during that time Pat gave birth to another daughter, Tammy. Service in Vietnam brought to an end life on the base in Utah. Wes was sent to Binhtuey in January 1971 and stationed at the radar site in the Mekong Delta. Pat and the kids moved to a house trailer just down the road from Titus and Ina Rose at the old homestead in Washburn. Wes says of his time in Vietnam, "I worked on maintaining air-to-ground communications with the Vietnamese. We directed air traffic control and with a two hundred-mile radar system we would vector in air strikes. The base was at sea level and I had a roof over my head every night; it's not like we were out in tents in the bushes. We were issued M-16s when we had rocket attacks. These rockets had no guidance system at all, and looked like a giant Roman candle going off. When I returned from the war I wasn't spit-on or anything like that, but I do know some people that were. Some thought of us as baby killers. I'm not a fan of Jane Fonda, but that's water under the bridge. I just wanted to move on." When Wes got on that "Freedom Bird" in Vietnam to return to the U.S. it was 103 degrees with 99 percent humidity at 10:00 A.M. A few weeks later he and the family pulled into Minot, North Dakota, in their family station wagon in twenty-three degrees below zero temperature and a howling forty-mile an hour wind. Such is life in the military. Wes had made Tech Sergeant so he was supervisor over-seeing maintenance of air traffic control in the control tower radio station. The Stevens lived in North Dakota for four and a half years (I wonder if Wes and Phil Heilman ever passed each other on the highway) and in the interim Pat had another baby, Erica. Pat adjusted well to all the moving over the years; in fact, she loved it. She does admit, however, finding a new home each time was the hard part. The next rotation was back to Europe, this time the huge base of Remstein Germany. They lived nearby in the quiet farming village of Langwieden, population two hundred. The Stevens' were the only Americans there. Wes had earned yet another stripe and was a now Master Sergeant, again doing supervisory work at the base. Pat said of their life in Langwieden, "The people treated us extremely well and adopted us into their village. Most thought that America had done Germany good. We lived next to the Berger Meister. It was a cross-section of humanity. One guy across the street spent twenty-two years in the French Foreign Legion. Another had been a prisoner of war in England; he said they only got one potato a day, but his British captors only got one potato too, so he thought he was treated extremely well. There were many in that village that had been prisoners of war in World War II; several had spent time in Canadian prisons as well. The village social center was the Gausthaus. We were invited to a birthday celebration when the keeper and matriarch of the family turned eighty years old. They had a formal catered meal for her at the Gausthaus. They also took us along on their traditional annual outings. The whole village went too - sometimes for a sit down meal!" Wes had bought a Triumph Tiger from a G.I. acquaintance and especially enjoyed riding every Sunday with his motorcycle friends through the German countryside. The last stop for Wes, Pat and the kids during his service years was a stone's throw from where Paul Revere was captured on his midnight ride. They once again lived on base, this time at Hanscon Field near Bedford, Massachusetts. Wes retired from the Air Force there in 1982. The Stevens' wanted to move south to a warmer climate to finish raising the kids. Joanne was now sixteen, Tammy twelve, and Erica four years old. With all their belongings in storage and Wes's parents taking care of the kids, Wes and Pat hit the road looking for a new home. They drove down through Texas, along the Gold Coast, down to Cape Canaveral and back up the Florida coast. They settled in Pensacola. Wes was hired at George's Marine Electronics servicing marine radios and electronic fish finders. Pat devoted full time to raising the kids and being a homemaker. Soon the family was on their feet enough to buy a house. An opportunity with the civil service came along for Wes to work at the Naval Air station doing repair and overhaul of aviation electrical equipment, including black boxes. He worked there for thirteen years until they shut down the aviation depot in 1995 and turned it into a training base. The next few years he was basically unemployed. He tried a few different avenues of employment including the merchant marines. He was a deck hand on a supply boat offshore in Louisiana, but the work was just too exhausting. Luckily, his next job was back in his field of expertise. He maintained training devices for Fidelity Technologies in Pensacola. Wes retired from there in 2000 and has now volunteered to come back on a part-time basis. "The sense of freedom you get when riding a motorcycle always appealed to me when I was a kid. I had a lust for a motorcycle so much that I ran away from home once when I was fifteen years old. My cousin and I pooled our berry-picking money and went to Springfield to buy a motorcycle. We were gone for three days; of course nobody wanted to sell a motorcycle to a couple of fifteen year-old kids. Motorcycles were dangerous in everyone's eyes that I knew, and nobody I knew had motorcycles, but I still wanted one. I was talked into buying a car instead. I bought a 1950 Mercury." Wes said. Wes's first bike was a two-stroke Yamaha 125cc twin scrambler that he bought while stationed in Utah. He recalls, "Our friend and neighbor had a couple of motorcycles and he's really the person who got me going on the track of riding motorcycles. I took the scrambler out in the desert south of Salt Lake City once on one three-day weekend and was lost half the time. I fried myself because I didn't wear sunscreen to protect my skin: it peeled away from my nose and face in layers." Pat rode as passenger occasionally. On one occasion she hopped on the back of the Yamaha for a ride up into the hills and almost slid off the back of the bike; she was about six months pregnant with their second daughter Tammy at the time. She did like motorcycles, however. Pat said, "I like bikes because I went out with boys in England that rode motorbikes, BSAs usually. My first ride was when I was fifteen years old. I wasn't scared at all and would wear high heels and a skirt and no helmet around Brumbury all the time." While in Vietnam Wes read all the motorcycle magazines he could get his hands on. He saw a full-page advertisement for a BSA Gold Star. He just had to have one. When he returned and was stationed in Minot he found one at the Guzzi dealer located one hundred mile away in Grand Forks. He bought it and hauled it back in his van. It became his pride and joy. He didn't care that it was a high-maintenance bike that vibrated a lot; he loved the ride and handling. He sold the Yamaha. He said of his Gold Star, "Your fillings would be falling out - boy that thing vibrated. It took all of my energy to keep the nuts and bolts tightened. I was pretty daring in those days. I thought it would go anywhere; it almost would. I rode it over miles and miles of gravel road across North Dakota because only about thirteen percent of the roads were paved. I used to have that thing at sixty to seventy miles an hour on gravel; it handled well at that speed. I tried to ride it three hundred and sixty-five days a year, which is pretty hard in North Dakota. It had knobby tires so riding in the snow was okay, but icy streets was another matter. I almost lost my little finger one time when I slid down on ice and my little finger was caught between the handlebar and the ice." Pat didn't go on rides with him that much on the Gold Star because she needed to be there for the little kids. Even though it really wasn't a two-up bike, she would still go on Sunday rides with him. Wes used to take Erica out in the woods to ride the trails. As a kid she started out on a Honda 80. He said, "I tried powering around her on these trails but she was so quick on that little thing. She wanted to do jumps with the motorcycle so I got a two-by-eight board about four feet long and put it over a four by four and let her jump. She got pretty good at it - she could sail." Motorcycling wasn't for the entire Stevens family. Tammy tried riding the Gold Star one time. Pat said of the occasion, "She got on the BSA once and went right into a ditch. She got off, marched into the house, got so mad she never got back on a bike again." Wes has a few scars as souvenirs of his Gold Star days, including a badly broken leg he suffered in 1975. During the summers he used to ride out to watch local amateur motorcycle races, which took place on a grassy field. Wes tells of the time he broke his leg, "Somebody brought a van with a keg of beer so we sat around all day sipping on this beer watching the races. When it came time to leave, I couldn't get the bike started. I said, 'I'll catch up with you guys on the highway.' When I finally got it started I decided to take a short cut across the wheat field. The highway zigzagged every few miles and I thought the field had to be shorter. I rode across a ditch, bottomed out and fell off and broke my leg - and didn't know it. It was fifteen miles from the nearest paved road out in the middle of a wheat field. I thought I had sprained my ankle. I got back on it to ride the one hundred and forty miles home. Along the way I ran out of gas and bummed a gallon from a wheat farmer. I finally got back home at midnight. I couldn't put the side stand down; it was too painful. I leaned the motorcycle over against some garbage cans and got off knocking them over. Pat was awakened out of bed and had no sympathy for me whatsoever." Pat said, "I thought he was drunk! I was eight months pregnant. I was mad and didn't even speak to him when he came in." The next morning they looked at his leg. Pat drove him to the dispensary. The medic took an x-ray and said Wes needed to go to the hospital. They had to put in two stainless steel screws to hold the bone back together. He had a cast on for several weeks and limped badly for a couple of years. In due course he started walking to work and jogging everywhere. Finally his limp went away and he feels the leg might actually be stronger than the other one now. Wes kept the Gold Star for several years and ended up selling it to a German fellow who took it back to Germany. Like many of us, Wes tried out and owned many brands of motorcycles before settling on Moto Guzzi. A brief history of motorcycles owned by Wes include: The Yamaha Scrambler, the Gold Star and Tiger as mentioned above; a Royal Enfield with a Norton Featherbed chassis that he shipped from England to Boston when he was stationed at Hanscon Field; a 1974 GT750 Ducati; a 1991 FXRS Convertible Harley-Davidson; a 1993 California III; a 1100 1995 California; and a 2002 EV. He still has the Royal Enfield, the Ducati, and of course, his main ride, the 2002 EV. Said Wes of his 'Harley Era', "After I became disenchanted with my 1991 FXRS Convertible Harley (the one with detachable leather saddle bags and windshield) I upgraded to Guzzi. The Harley was falling apart underneath me after 30,000 miles. Pat liked it because it was a good two-up motorcycle and liked to go on trips with me on it. 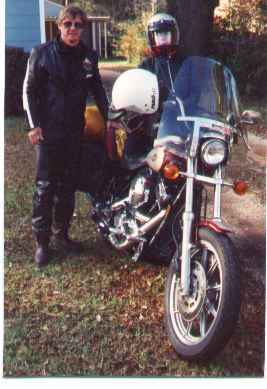 We rode from Pensacola to Washington DC on it and up through the Blue Ridge. 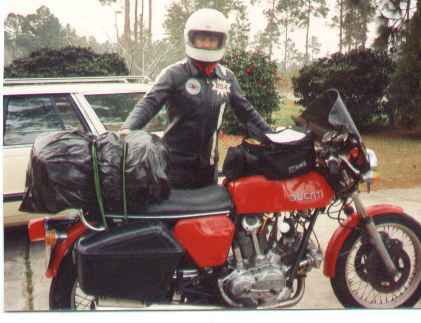 Joanne rode her 400cc GS Suzuki down to Bike Week in Daytona with us one time. It took us two days to get there because the Harley broke down. That worn out Suzuki sailed along with no trouble. 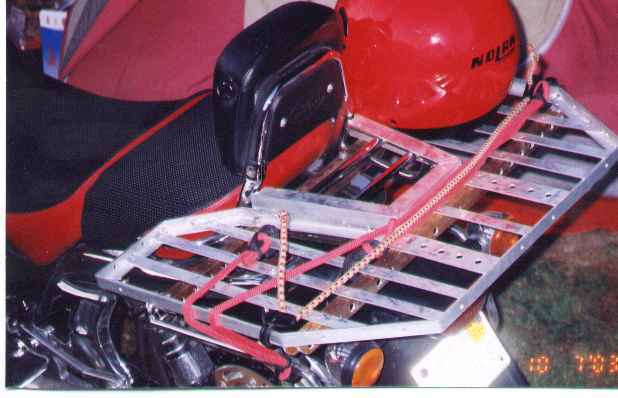 When the battery went dead on the Harley we had to jump the battery from the Suzuki." After their Harley experience went sour, a poster of a Moto Guzzi 1000S and a few favorable motorcycle magazine reviews of the bike caught his attention. He envisioned it as a sport-touring bike. At the Muscle Shoals, Alabama Guzzi dealer he took one for a test ride. Upon putting the kickstand down, Wes had second thoughts about it becoming a sport-tourer; he bought a 1993 California III instead. He said of his first Guzzi, "This big valve motor was a hot rod and it wanted to go to eight grand instantly. After I brought it home Pat and I rode it out to Perido Key. We were in fifth gear at fifty-five miles per hour and I asked Pat, 'what do you think?' She said, 'Okay, but shift out of second gear!' In an effort to make it a touring bike I changed the gearing in the final drive. We kept the bike another year or two before I sold it to Cal Patrick in Seattle who had intentions to turn it into a drag racer. In 1995 Wes bought a new 1100 California from Gene Jones in Eldorado, Arkansas. Wes would go on to put one hundred and thirty thousand miles on it, much of that with Pat on board. Some of their favorite trips include the Blue Ridge Parkway, cross-country to California for the MGNOC National in Grass Valley, and the National in upstate New York. On one occasion, Wes rode to Baja with good friends Karl Werth and Bill Yoder where they had a memorable time camping on the beach. The next Stevens Guzzi was a 2002 EV, again purchased from Gene Jones. One of the big factors in the decision to buy the EV were wheels that would take tubeless tires. They rode it to the National in Mt. Vernon, Washington this year. Wes gives a brief explanation why he likes Moto Guzzi, "I'm really a fan of Italian engineering. Along with Moto Guzzi I've owned Ducati and a couple of Fiat Spider sport cars. They may over-engineer certain aspects, but the Italians make their machines into fine art, in my opinion." Wes and Pat joined the MGNOC when they bought their first California. They are now lifetime members 433 and 434. Wes said, "We paid the yearly fee for a couple years and I thought, heck, we going to be members all our lives so it made sense to become lifetime members. We also subscribe to Motorcycle Consumer News. In an article a few years back they said that the MGNOC was the best club. I thought, yeah, right on!" The MGNOC has had a major impact on their lives and has definitely increased their passion for attending Guzzi rallies and events. 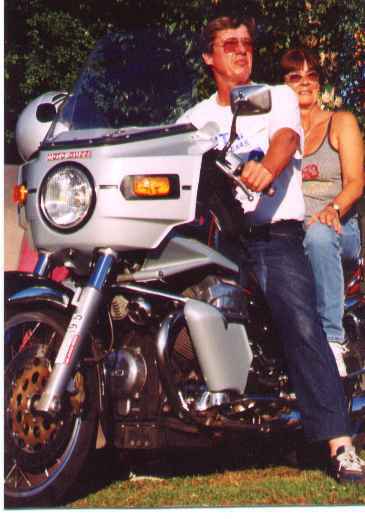 The couple has enjoyed all the rallies they have ridden to and one of their very favorites is the Guzzi/Beemer Louisiana rally that Crazy Dave puts on. They both enjoy the Cajun atmosphere. Wes said, "There's a lot of older people in this club, I kind of fit in, but the zest for life that those Cajuns have, whether it be food, music or whatever, makes me feel young again. Back at the homestead in Washburn Missouri it's Bible belt, a Baptist environment. Beer drinking, music and dancing were discouraged. I remember when a high school made the national news a few years ago because they wouldn't allow the graduating class to have a senior prom because there was dancing. We may party too hardy, but we really enjoy the Cajun music and dancing." On their appreciation of the MGNOC Wes said, "It's the people as much as the motorcycles. It's the friends we met at rallies. We've seen Randy and Judy Dawes at rallies on both sides of the country, California and Louisiana. We've been together with Ken Hand and Peggy Tillery at quite a few. Karl Werth is a good friend, Van Bartlett from Oklahoma another. The North Florida Rep Jim DeGregoria throws a great rally. He's an old retired Air Force guy too. He always goes out and catches fish for one of the meals at his rallies. He's got more energy than I do, and I'm sure he's older than I am. At the National in Mt. Vernon we camped next to New York "Traveler at Large" Carl Simmons. JN Smyth is an inspiration to me, I want to keep riding as long as he has. He rode back with us from White Springs several years ago. I could go on." As illustrated in this story, Wes and Pat have been on the move much of their lives, spanning two continents. Today, with the kids on their own, for many years now they have made their home in Pensacola, Florida. Pat works part time at the Perdido Sun, a condo development on the beach, as supervisor of housekeeping crew. She enjoys working out at the beach and gets off early in the day after she checks the units. Wes continues to work part time with Fidelity Technologies. Their great passion remains getting out on the open road on the Moto Guzzi and to enjoy the company of their Guzzi friends. This is what keeps them young. To the readers of this story, coming straight from the heart, Wes and Pat would like to say, "Thanks guys for having us."